January 14, 1945 was a big day for the 357th Fighter Group. 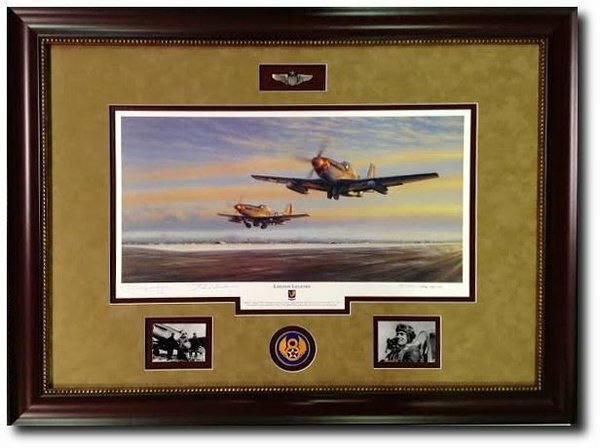 It was also going a memorable day for two 357th pilots in particular - Bud Anderson and Chuck Yeager. It was their last mission, having reached the end of their second tour of duty. Anderson was the Squadron Operations Officer, so he scheduled himself and Yeager as spares that day. There was little chance of contact with the Luftwaffe by that time, so the two decided they would leave the formation after takeoff, if they weren't needed, and go off on a little aerial sight-seeing tour. They dropped their wing tanks on Mt. Blanc and strafed them, buzzed a hotel on Lake Annecy, and did a few other things that could have brought court martial charges against them. They were the last two Mustangs to land at Leiston that day, having flown over a thousand miles. There was a lot of excitement evident at Leiston as Yeager and Anderson taxied their Mustangs to their hardstands. The two were thinking the crowd had gathered to celebrate the two pilots completing their tours of duty. Instead, they learned that the 357th had had it's most successful air combat of it's history on that day, claiming 56.5 enemy aircraft destroyed. The figure was officially revised to 55.5, which stands as a record for one day's action in the Eighth Air Force. Yeager and Anderson had entirely missed the "Big Day" for the 357th. 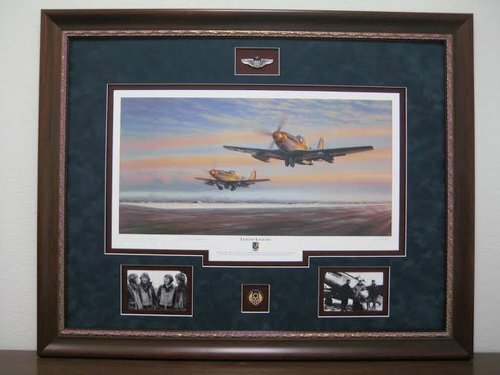 Leiston Legends depicts Bud Anderson in "Old Crow" and Chuck Yeager in "Glamorous Glen III" as they lift off from the main runway at Leiston on the morning of January 14, 1945, a date that legends were made.